One of the more identity-warping aspects of parenthood is the way that it has pushed certain traditional gender roles into my marriage. I didn’t expect this: I grew up in the “girls can do anything” generation and married someone who had no interest in being a stereotypical breadwinner. But then BAM! societal structures whacked me in the face. Some of it seems to make sense in the context of our family. My husband is older than me; he has a real job and I’m a grad student. Now that he’s working outside of academia, he makes a lot more than me. My status as a student means that my hours are flexible, my vacation is not tracked, and, well, it just makes sense for me to be the one who stays home when the kid is sick. To be the one who takes at-home days so that we can save money on daycare. If we have a second kid after I finish my PhD, it’ll be totally logical for me to be the one to take “leave” for a few months or maybe longer. But… Would that calculation change if my husband’s new job offered paternity leave? (It doesn’t.) Would I have chosen to stay home as much as I did if daycare were more affordable? What happens when we move somewhere where daycare costs even more? Where the waiting lists are months long? Who has to stay home then? What happens if we have that second kid and I take some time off to parent—will I be losing forever the opportunity to have the kind of career I once imagined? Am I doomed to be the secondary breadwinner, looking at a life of trying to sell jewelry and fake nails to my friends? My husband and I had a fight the other day about money. He’d started to say things that sounded like he thought of his salary as something he earned for himself and partially distributed to me for stuff, as opposed to something he earned for our family. It turned out we were taking our worries out on each other: he felt bad about spending less time with our son (he’s had to work weekends recently), while I was worried (jealous?) that I made so much less. It bothers me very much that we’ve been pushed in these directions. Today is one of my at-home days, and I’m busy trying to fill the hours with dishes and knitting and crayons. Likely my husband will be working again this weekend. I feel unfulfilled, like I’m turning into the stereotype of a bored 1960’s housewife. This is my response to Kate Schweitzer’s “A Letter to My Baby on Our First Mother’s Day,” a piece that’s been making the social media rounds this year. This is our second Mother’s Day. You haven’t the foggiest idea what that means yet, except that Daddy will give you a pen and ask you to draw all over my card, which you will do with great care and enthusiasm. Because that’s what Mother’s Day means: it means I’m part of a family. Before you were born, for all those months that I carried you in my womb, we were a family. Your Daddy and I laid our hands together on my stomach to feel your hiccups. We worked together to prepare you a room, and we went to classes to learn about your arrival. My body did the hardest work of growing, but your Daddy was always there to keep me (and you) close. The day you came into this world, the moment we met, I smiled and told your Daddy to follow you to the nursery. His bare chest comforted you; his heartbeat soothed you. You came to me an hour later, tiny and pink, and I was astonished—how could something this amazing have come from me? Your Daddy helped me carefully hold you, carefully bring your tiny head to my breast. Your first few weeks, we learned together how this family would work. My milk fed you, but your father and I shared the journey of staying up with you late at night when you didn’t understand the difference between night and day. I learned to pump milk so that others could nourish you in my absence. Soon, you started to take a bottle with ease, and I rejoiced to watch you snuggle with your father and your grandparents. I read you books and played with your toys—and so did they. We all watched together as you learned to focus, learned to smile, learned to reach, learned to roll. It was always you, and me, and our family. After six weeks, I went back to work part-time, trading shifts with your father. We woke at night together when you stirred, he to change your diaper, I to offer food to soothe your rumbly tummy. I remember snuggling in the quiet night with you, alone in the darkness. I also remember the nights when you would not sleep, when I cried and your Daddy came out to take over. And then, you began to sleep through the night. You no longer needed me in the darkest hours and I rejoiced. I rejoiced because it was never about you and me, and how you needed me. It was about you. About you growing, gaining independence. Watched and loved by two parents. You need me now much less than you did in that first year. You run on your own, and you wiggle away when I try to hold you tight. Someday your father and I won’t need to change your diapers, or pick out your clothes, or slice your food up into bite-size pieces. Someday you’ll be reading on your own, truly reading and not just the nonsense syllables you make now as you turn the pages for yourself. You have grown so much, and I am so proud. It was never just you and me, and we are all the more blessed for it. You have learned that many people provide safety and comfort, and you have learned that Mommy and Daddy always, always come back. You are making friends at daycare, and I delight in the joy that shows in your face as you run around together. So this Mother’s Day, our second Mother’s Day, I am going to sleep in. I am going to take Daddy up on his offer to watch you all day. I don’t know what I’ll do yet with that time—maybe I’ll have lunch with a friend, or go shopping, or just curl up at home with a book. Because I know that I need that break, and that I’ll be a better wife and mother for it. Because I know your face will light up when I come back, just as it lights up when Daddy comes home from work. Because I know you will always be my baby, even when I’m not around. Navigating family gatherings can be tricky for any number of reasons, but it’s an especially hard task when you’re an introvert. You’re expected to be “on” for hours at a time, smiling politely and answering the same three small-talk questions over and over. School is going fine, thanks. I’ve got about one year left. Yes, Little Boy is doing well. He’s picking up more words. Yes, my husband likes his new job. Various groups of people that you only sort of know and only sort of like mill around doing nothing in particular. It’s exhausting. This one is the absolute #1 key to my survival at family get-togethers. It’s amazing how just a few minutes of silence can be enough to power me through another hour of chatty performance. Being an introvert means that you require alone time to recharge (versus extroverts, who are recharged by interactions with other people). So to keep from running out of gas, you need to find some alone time. At least in my family, disappearing for long periods is frowned upon and earns one the label “antisocial.” But a 5-minute break slips under the radar. Depending on where you are, there are different options for where to take these short breaks. Best-case scenario is when you’re staying at that relative’s house and thus can duck into “your” room for a few moments. Otherwise you can duck outside, or into the garage, or a quiet room. When all else fails, the bathroom is your friend. A few years ago, I discovered that I am much more tolerant of small talk when I’m knitting. Doing something helps me through the weird party state of having to be on and attentive while nothing in particular is happening. Knitting, crochet, and other handcrafts are perfect here because they’re portable, and because people don’t perceive them as negatively as, say, reading. You will have to put up with a constant refrain of, “What are you making?” But at least then you can talk about something that interests you. When it comes to making it through a lot of social interaction as an introvert, food is fuel. Don’t skip the appetizers, especially if you know grandma won’t be putting the roast on the table until 8 p.m.
There’s a level of balance here—eat too much, and you’ll be sleepy and uncomfortable—but seriously, it’s not the time to go on a diet. Imagine a multi-hour family party as a marathon: you need to keep your energy levels up over the long term. In moderation, of course, and only at events where others are drinking. No joke though: alcohol helps. My ability to keep up pleasant small talk gets infinitely better after a glass or two of wine. Any other good suggestions for me? Now imagine this on an excited one-year-old. It was adorable, if I do say so myself. He even tolerated the hat for short periods of time. This Halloween turned was a fun holiday for us. We’d been apprised by the homeowners that this neighborhood is a prime trick-or-treat destination, and we were not disappointed. I honestly don’t know the last time I did Halloween in the classic way, with the big bowls of candy and the doorbell constantly ringing. I feel like it has to have been more recently than high school, and yet I can’t remember any year between now and then when it happened. I do have one public service announcement for parents: please teach your wee ones a modicum of patience. Sometimes it takes me a few seconds to get to the door. Kids, you don’t need to (a) ring the doorbell repeatedly, or (b) turn away to leave if the door doesn’t open instantaneously. I know that Halloween is thrilling, but if it can be a good learning opportunity for saying “thank you” (and I saw lots of parents helping their kids practice that, which was great), it can also be a good learning opportunity for door etiquette. I’ll hopefully be getting back to blogging semi-regularly again here soon. Focusing on a different hobby for a bit was beneficial in some ways, but I’m ready to switch back. The making of Little Boy’s Halloween costume continues. 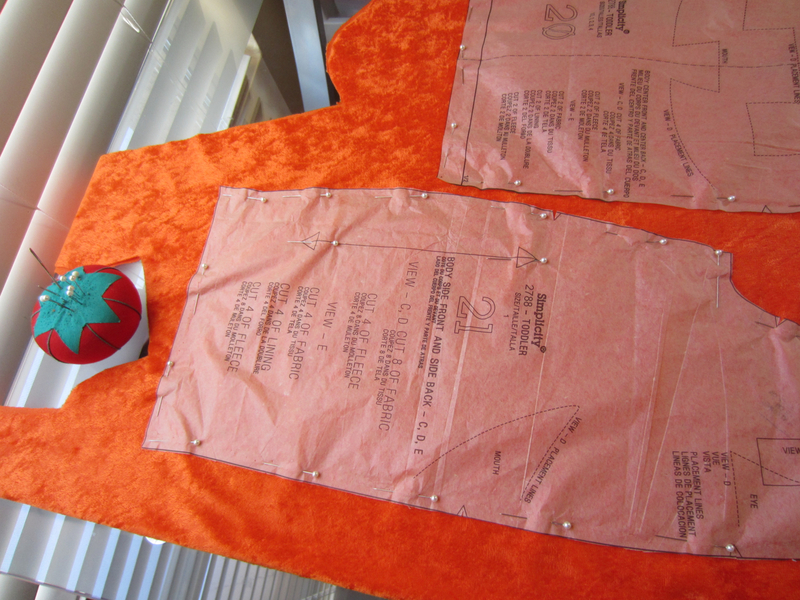 This weekend’s step was the cutting out and marking of all the pattern pieces, a.k.a. 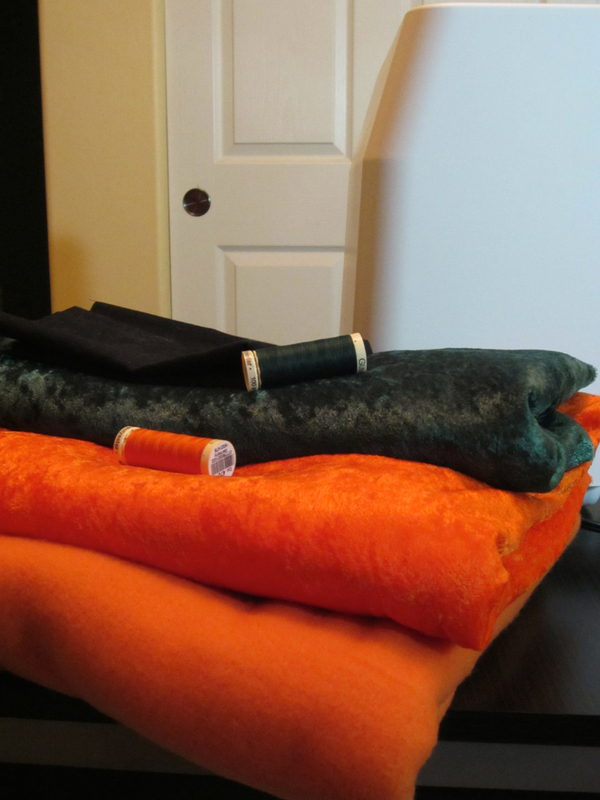 the most tedious step of any sewing project. The pumpkin is lined, which means twice the pieces to cut out. I can’t help but think back to this time last year, when I cut the pieces of an infant tiger costume with said infant strapped to my chest. It was exhausting. But that was back in the days of wildly unpredictable naps, so the fact that he stayed asleep for hours in the baby carrier was a blessing. That was also back in the days of working on the kitchen table in a poorly lit apartment; today, as the above picture illustrates, we have a lovely glass desk in a bright office. We’ve been taking regular family walks lately, in the space of time between Little Boy’s dinner and his bath, but this evening the adults were rather tired. Little Boy: Crawls into hallway, where he picks up his shoes and sticks them in his dad’s face. 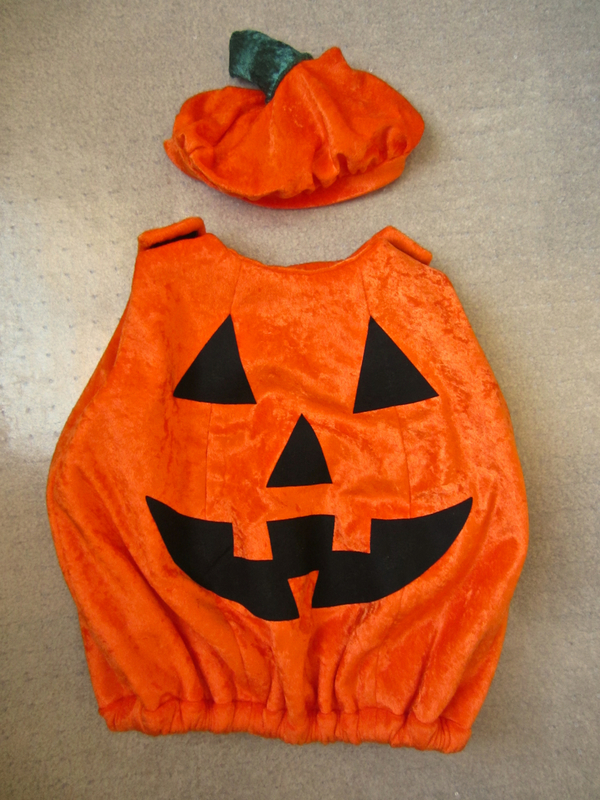 If you don’t hear much from me this month, it’s because I’m using my spare time to make Little Boy’s Halloween costume. I’ve never been very good at just throwing costumes together from stuff on hand, but I am decently good at using a sewing machine to follow a pattern. This year, that pattern is Simplicity #2788. There’s no way my kid is going to pose this perfectly. 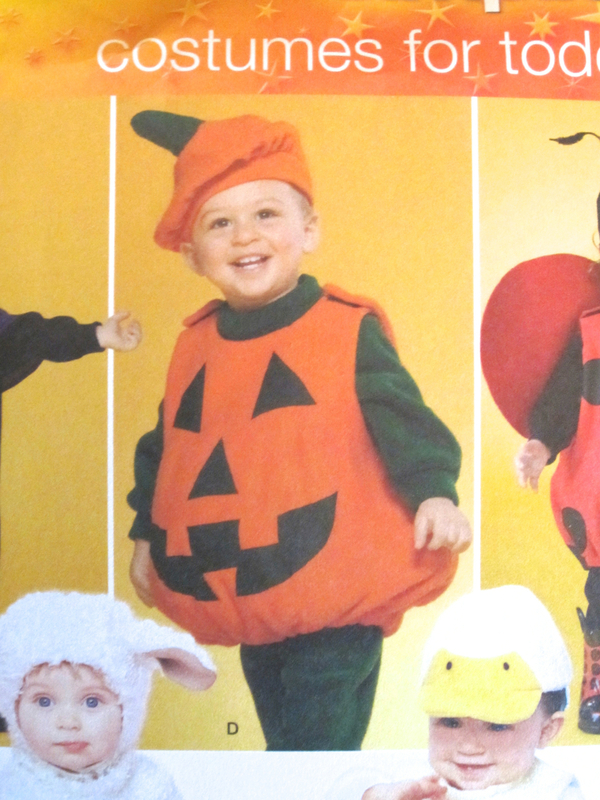 That’s right, if all goes well, Little Boy will be an adorably round pumpkin for Halloween. Apparently our new neighborhood is full of trick-or-treaters, so we’ll be able to get into the spirit of things a bit more than we have in the past. Don’t ask me what my costume is going to be, because I haven’t decided. Zero-effort (i.e., costume already exists in my closet) options include cavewoman, Master’s degree graduate, calico cat, and Lieutenant Uhura from Star Trek. What are your plans for Halloween, readers?